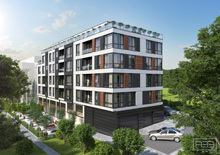 Buy in Bulgaria is offering this panoramic, two bedroom apartment in the centre of Varna. The building was completed in 2017 and has 8 floors. It was built using high quality materials and modern construction technologies. The apartment itself is on the 7th floor and is facing South, which makes it sunlit and warm. It consists of an entrance hall, panoramic living room with kitchenette, two bedrooms, bathroom and a large terrace. For more information and viewing, please, do not hesitate to contact us.